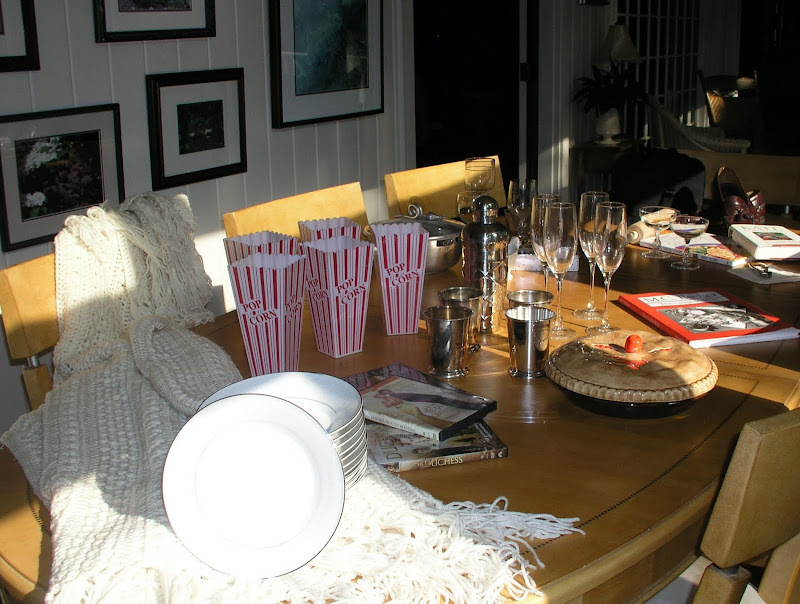 Affordable Accoutrements: No Estate Sales! There were no estate sales in my area this weekend … none! So … what’s a bargain-addicted boy to do? Hit the local thrift and junk stores of course! I’ve purchased some of my favorite things at local Goodwill stores. It pays to go often, keep an open mind, know how to identify items you collect, and pay attention to what’s on sale. It’s also a good idea to visit antique shops and malls to get an idea of typical prices (and to do searches on eBay and Replacements.com for the same reason). Then if you see something you need or want, in good condition, and for a fair price … you’ll know to purchase it without hesitation! What do these items have to do with each other? Not so much actually. They’re sort of a “best values” still life. 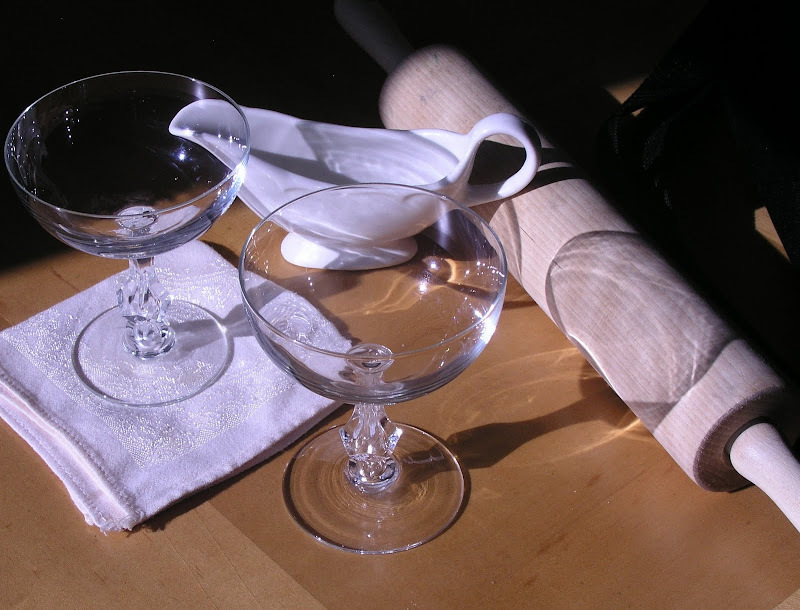 The sherbets cost 25 cents each … and they’re vintage Heisey crystal from the 1950’s. The pattern is “Tempo.” They match some water glasses I picked up at a recent estate sale. The small sauce/gravy boat is also a vintage item, made by Homer Laughlin. I collect restaurant-style ironstone, and this will blend in perfectly. It cost 50 cents at Goodwill. The “Tempo” sherbets came from a wonderful local junk store that carries merchandise purchased from storage auctions. You can read about those in THIS POST. The owner threw in the vintage damask cocktail napkin and the rolling pin ( FREE is good!). I used a similar one while making homemade buttermilk biscuits this morning. This one’s slightly larger. You can’t have too many rolling pins, right? The DVDs were $2 each. The Sheridan silverplated julep cups each cost 50 cents. The hand-crocheted afgan, the plastic popcorn boxes, the cocktail shaker (with a jingle bell in the lid --- FUN! 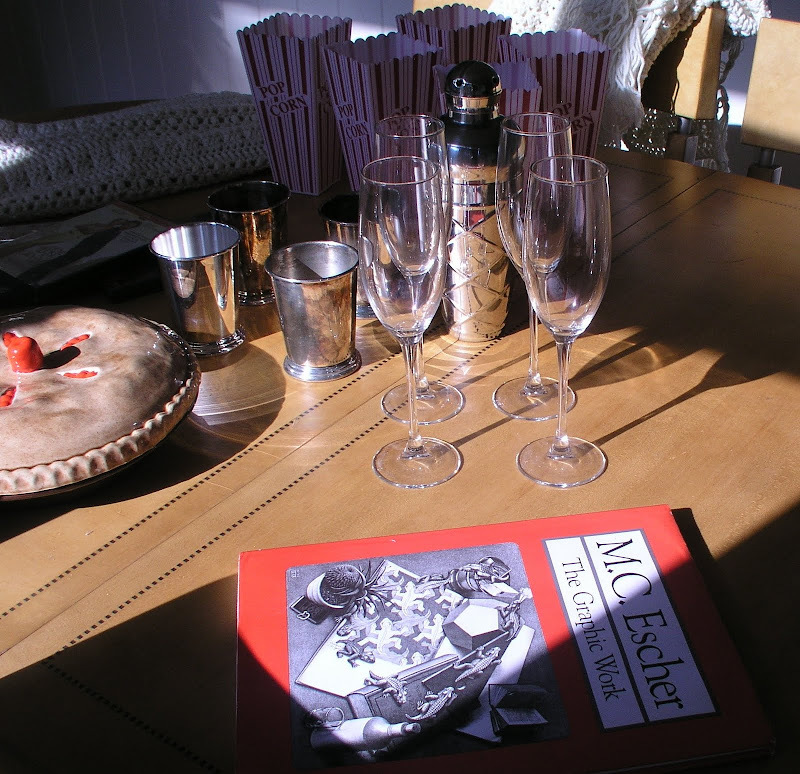 ), the ceramic lidded pie plate, eleven vintage Salem China platinum-rimmed white bowls, and the tall champagne flutes totaled $6. At thrift/"junk" stores, I often ask if it’s OK to start a pile of items I want and then, when it’s time to check out, ask the total price for everything. It seems to work better that way. Generally, if it’s a privately-owned shop, the more items you buy, the better the prices will be. If you’re a regular customer, shopkeepers know they’ll keep you coming back if they offer you the best possible deals. The two hardcover books were 50 cents each. An extra pair of pliers is always a good thing to have around. I don’t usually look at shoes at thrift stores, but I noticed these classic tassel loafers were by Johnston & Murphy, and the soles were barely scuffed. Yes, I gave them the sniff test, and they smelled like leather (new leather) … which is what I was hoping! The black nylon camera bag, a Mozart CD with companion booklet, two Heisey sherbets, pliers, damask napkin, shoes, and rolling pin totaled $4.50. 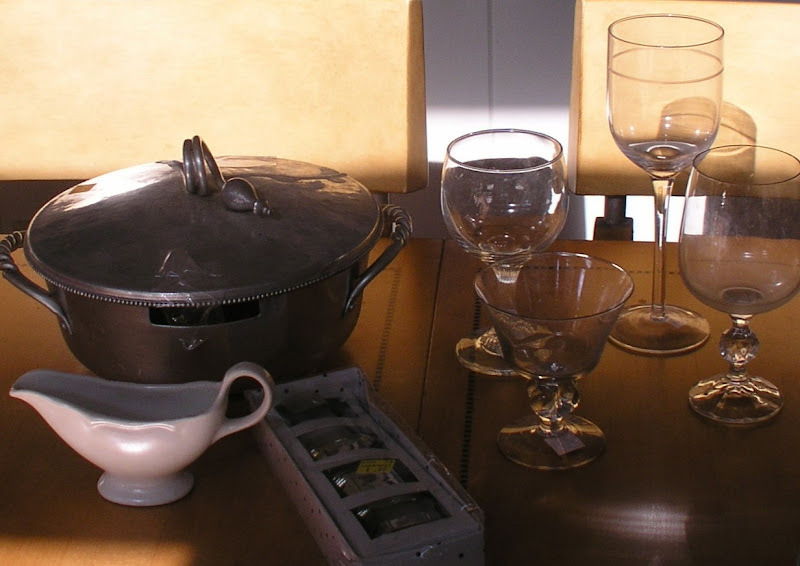 From Goodwill: Vintage aluminum casserole dish with lid, $2.49; vintage crystal sherbet, 25 cents; tall wine glass, 99 cents; low wine glass, 49 cents; “Claudia” crystal water glass with diamond ball stem, 49 cents; Homer Laughlin sauce boat, 50 cents; silverplated napkin rings (new in box), 99 cents. I have a set of “Claudia” water glasses. They were made in Eastern Europe and are discontinued. It’s always nice to have a spare in case of breakage! The M. C. Escher art book was 25 cents at a different charity thrift shop. The cocktail shaker still had the Pier 1 price tag on the bottom … $15! I’ve watched two of the three films, and enjoyed them both. At $2 each, it’s cheaper than a rental! I polished one of the julep cups for you (using Wright’s silver cream, of course!) so you could see how nicely they’d shine … and with very little effort! They’re all engraved with a cursive “B!” How perfect is that? Silversuperstore.com offers a set of 4 Sheridan mint julep cups for $49.95 (suggested retail, $80), and charges $34.95 to engrave 4 cups. I think I did OK with 4 B-cups for $2 … do you? I collect vintage aluminum items. I’ll show you some of them in an upcoming tablescape. Here’s a closer look at the bowls. Often, a standard place setting of china doesn’t include a soup/salad bowl. Buying them separately to match your pattern can be expensive! Extra bowls come in handy for serving first courses or desserts. With the white-on-white scroll pattern, these should mix-and-match nicely with other white dishes (with or without platinum rims). 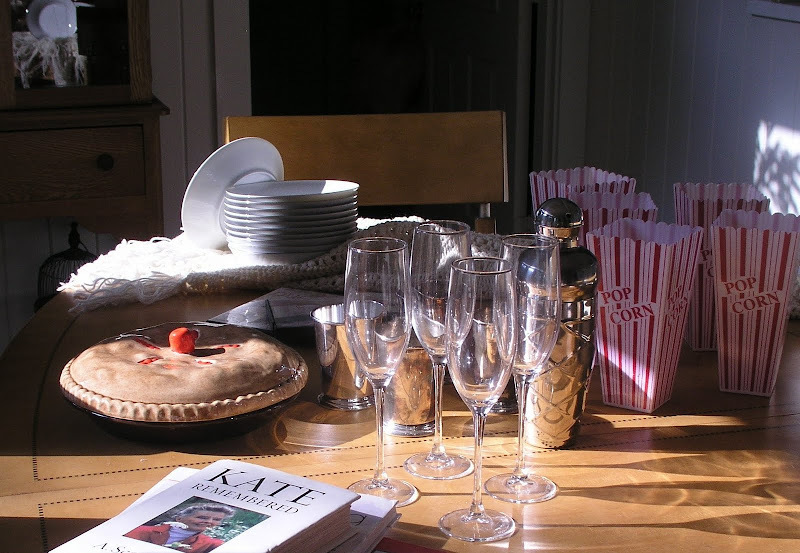 I included this image primarily because I thought the unintentional capture of the plates’ reflection in the glass door of the china cabinet (upper left) and the shadows of the wine glasses looked interesting. Are you ready for the “Metamorphosis?” In the final pictures, you’ll see the aluminum casserole dish, the julep cups, and the Heisey sherbets polished, cleaned, and ready to use. I’ll add a glass insert when using the casserole. Did you know Wright’s silver cream works great on aluminum? It had some discolored areas (and something that appeared burned on) … and it polished up beautifully! Well, those are my thrifty finds for this week. Tell me about yours? Of the items I showed you, which did you like best? What was the best overall value? Wow, Bill! Those are some awesome finds. I love the polished up mintjulip cups, so pretty and Southern & even have your initial. Now that's lucky! I also love those little sherbets, you must have some great thrift stores where you are. I guess I just don't hit them often enough, mine seem to have a lot of junk. You really scored some deals, thanks for joining the party this week. Oh, and you're right about Wrights, the best silver polish. 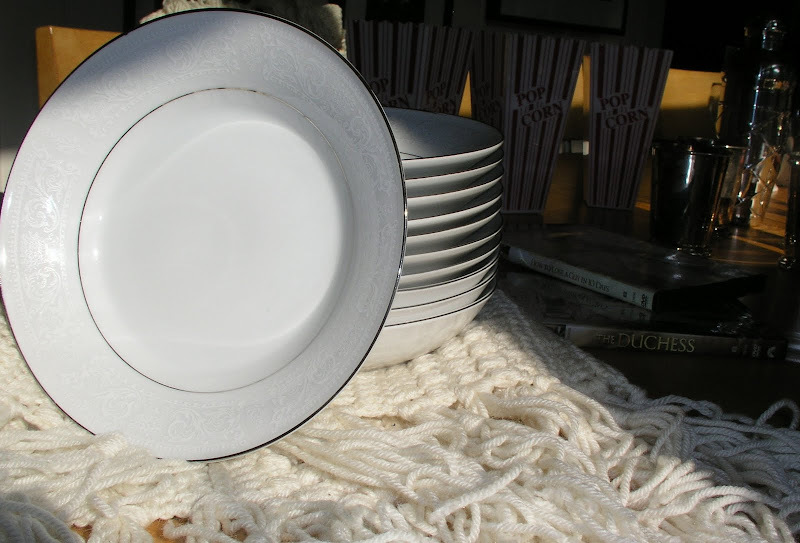 You must have the most amazing thrift stores in your area! I absolutely adore the mint julep cups - and so cool they have the B monogram. What an incredible deal. Everything is an incredible deal! And no, I did NOT know that Wrights polish worked on aluminum. Thanks for another tip! Love those Popcorn tubs! They're so fun! I love it all, Bill! You are an inspiration! Great job bill, wish I had your talent for finding the diamonds. LOVE those julep cups. Seriously great find. You display them so pretty on the tray with the glass/crystal? decanter. They were your best bargain, I think. The afghan and the popcorn boxes are more icing on the cake... Great job of finding goodies this week, Bill! Afternoon, Dear Bill! Oh, I love all of your treasures! I do believe you have better prices down your way! Shoot! Oh those sherbets are lovely and I really love the casserole with the swirly on top! You cleaned everything up so well. I always love visiting your blog, I know I'm going to learn something new! I'm using Wright's Silver polish and it does work easily. I really like your julep cups and casserole. I like seeing how beautiful items will turn out when cleaned and polished. I guess I like the shiny things, however your stemware is gorgeous too! You had a great day, amazing finds, and loads of fun along the way! As always, thanks for sharing! Wow...do you find great stuff! My favorites are the mint julip cups and the afgan! I just bought a tray this weekend that I think may be identical to the one you have in your last pic. I bet I paid a lot more though. Our thrift stores just don't have the goodies that your's does...wonder why? Maybe I just don't go at the right time or often enough. Beautiful china and crystal! Happy Met Monday and Thrifty Treasures! Oh Bob you are killing me here. Of course I have a story. Claudia glasses were the first ones I bought for myself back in the day. I had them for a few years. One evening the ladies from work were over and one gently, and I do mean gently, put down her Claudia wine glass full of wine and the stem snapped right in half. What a mess. Well we were all laughing (did I mention we had wine? )heartily when one of the other ladies said "she just put it down like this" and snap off with it's head we had another glass of wine all over the table. The fact that no one peed themselves from laughing so hard (okay we had lots of wine) was a miracle. Now I didn't care about the glasses as they were not expensive but oh the wasted wine was almost more than I could stand. So it is a good thing that you have bought some replacements. If and when one snaps in half I will expect you to think of me. Wow they did polish up nicely. You had some great finds this weekend. Great idea on the bowls too. Such great finds Bill! I have to say I really like those julip cups, how perfect for you! I love the plastic popcorn cups, too cute! The dvds are great and the price for everything is fabulous! I cannot believe the julep cups!!! They look very nice on your gallery tray! What great stuff! My kids would love eating popcorn out of those! Oh boy - Those julip cups! I've been drooling over those for some time -- One day I'll find some (I'd even pay twice the price! 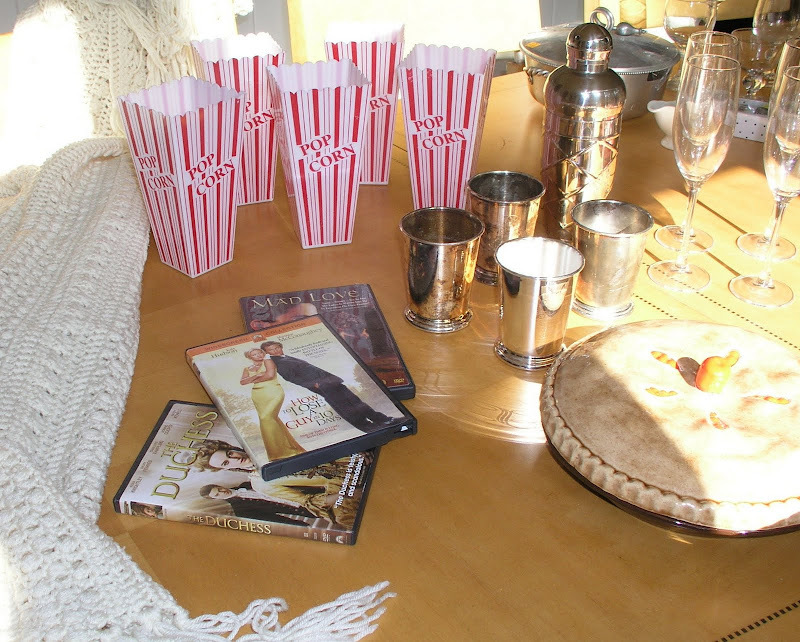 LOL) I've got those popcorn cups - just used them with a woman's group Bible study when the last night we saw a video - cut with the little glass bottled cokes! As usual -- Ya done good! Wow, what great finds. They look fantastic! You have a wonderful eye for quality bargains. I really love the julep set and the sherbets. All in all, I cannot believe how little you spent! Bill, You have been busy!! 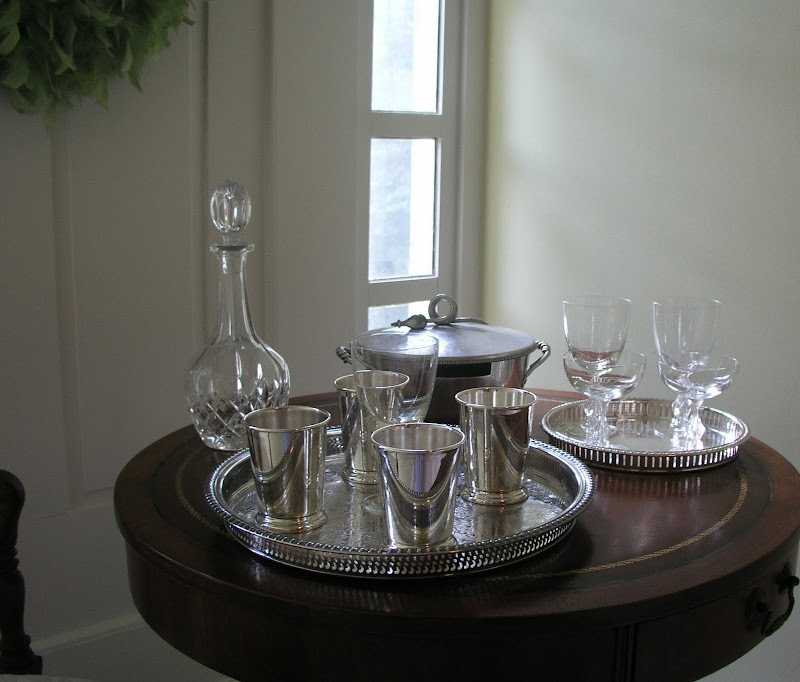 All your finds are great but the silver julep cups get my vote for the best value . . Wow!! 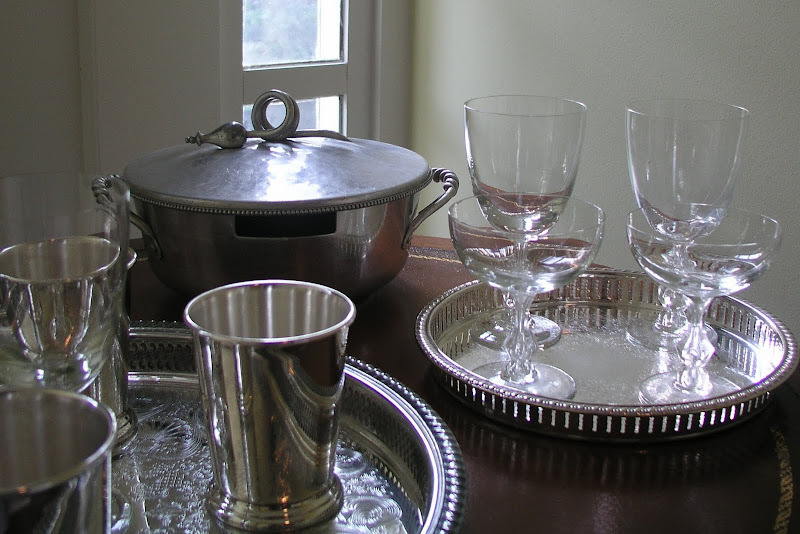 I love the silver Juleps,champagne stemware and the Salem china bowls. You did great. I need to get out to the local thrift stores. I've been fairly lazy and just searching through Craigslist and Ebay. Who needs an estate sale when you can bring home these things from thrift stores??? I want some mint julep cups, so badly!! And thanks for the tip about starting a pile at the check out-it makes sense. Your blog is always a fun place to visit. I am impressed with the ability you have of finding such wonderful treasures. Love all the things you bought and they have come up so well, just like new again. WOW!! What WONDERFUL treasures you scored. My Favorite is the casserole dish!! LOVE it! Great treasures. I was not so lucky this weekend! You found some wonderful treasures -- but then you always do. Wow! What great finds!! I would have to say that the best overall value lies with the MC Escher book (one of my favorite artist). I like the mint julep cups, although I've never had a mint julep, I like putting little arrangements in them during the holidays. The julep cups cleaned up well, didn't they? I think they'd be really pretty with flowers in them. Or a drink. Either way! Lots of great deals! 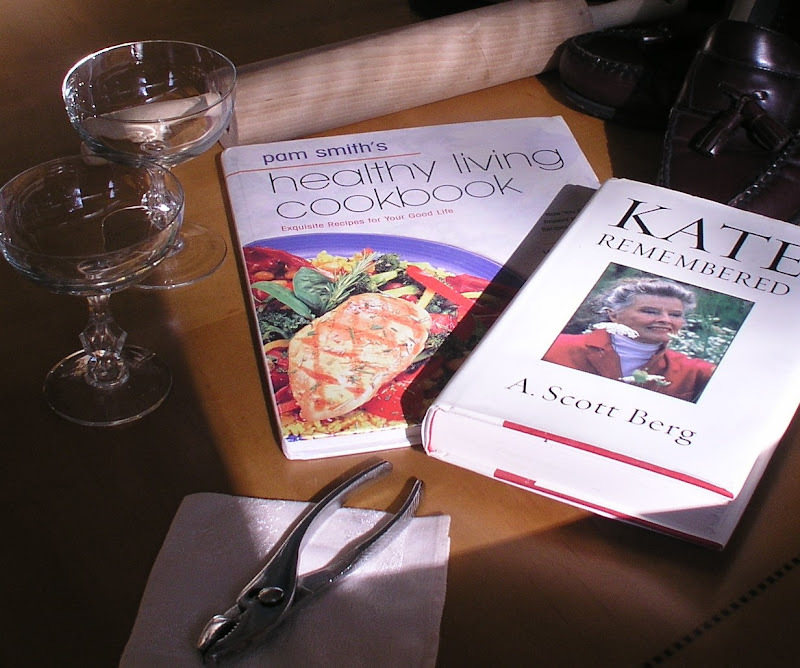 I love visiting your blog on Sunday nights from Rhoda's linky list---you'll love the A. Scott Berg book! You scored a treasure trove this week; good hunting! Ya did good once again! I love visiting your shopping trip finds! Keep these fun posts coming! Hi Bill ~ Loved, loved all your terrific finds! Those silver julep cups with the initial "B" no less...can't do better than that! 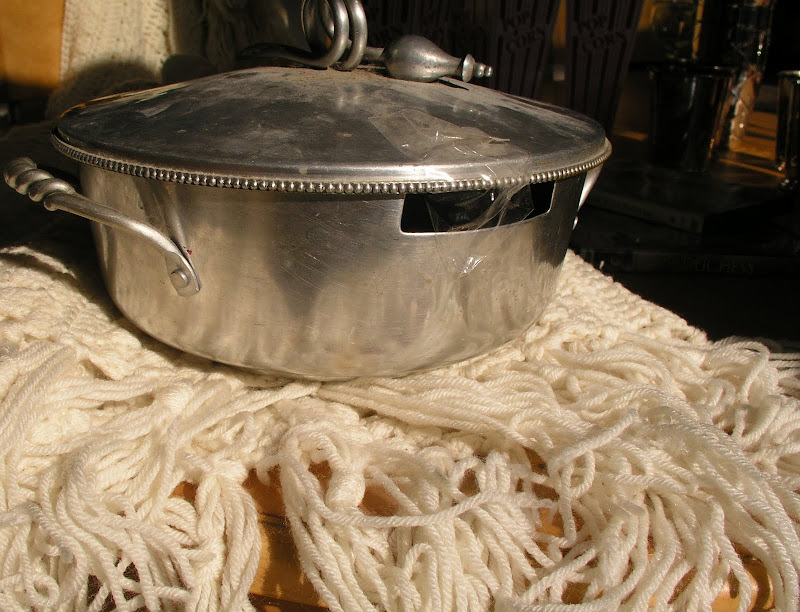 Also loved that aluminum casserole bowl. Everything polished up beautifully!! Hugs!! As usual great finds but the winner is the julep cups. I need to follow you one day for some of those great finds. Keep all the wonderful information coming. All items are really great, but I love the mint julep cups the best. Wow wow wow! All great items and great prices! I especially love the little mint julep cups! All I can say is Wow! May I give you my shopping money. You do much better that I do. And, I love those mint julep cups. I'm a B, too. I hope you join us for Pink Saturday again sometime. Wow-you found some great deals. Our Goodwill is very over prices on most everything-sometimes I find a good deal. They had 4 of those popcorn containers when I went yesterday. Come for a visit to check out my Knock Off Knock Out party-every Monday. New here, via Met Monday, and I just love your blog! You are a fella after my own heart -- I thought my DH was the only guy who actually WANTS to go thrifting every weekend. Good to know there are others! Lovely finds, I'll be back for sure! Amazing what a difference a little attention can make. Your afters are stunning! I'm so jealous of the mint julep cups---I've always wanted a set, but they're usually so expensive. What a great score, especially with that monogram. After looking through your blog, I think I'll go polish some silver. Wow, you really got some great things, and you sure have a large following now. It probably takes half a day to check out all your comments. I guess we are all excited to have a guy participating, and someone with so much style and great ideas! Don't you just love getting a bargain? I love the cocktail shaker. I've been looking for one, I'm going to have to look harder. Love the afghan as well. Please drop by and have a looksee at my treasures! Be well! Great finds, as usual! I think my favorites are the Heisey sherbets. Wah, I just bought some off eBay for a LOT more than you paid! I also love the mint julep cups. 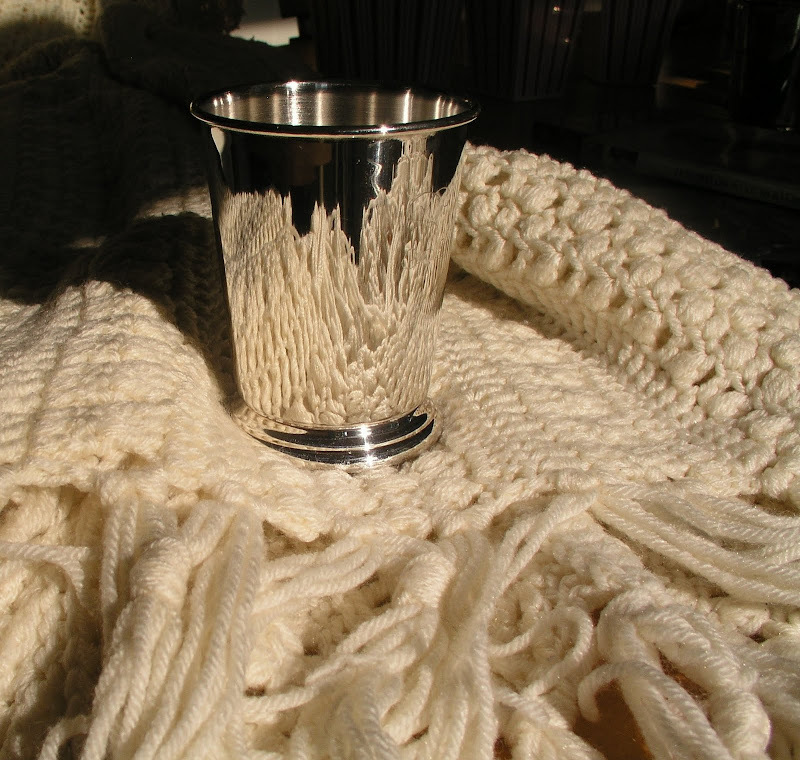 The pic of the polished cup sitting on the throw is so pretty, with the pattern of the throw showing onto the shined cup. Even without your estate sales you did great. I mean, honestly, isn't it just the most fun! I too collect aluminum pieces, and my favorite pieces are hammered. My goodness Bill, you have a very good eye for the very best, and at such bargain prices! I'm jealous, as Goodwills with quality goods are not easy to come by in my city. great stuff and really low prices - I am so glad you found the B mint julip tumblers - I'm sure you will really enjoy them. I can't believe the great finds you always seem to come across! Beautiful! I love them all, but if I have to pick a favorite I think I'm going to go with the casserole, look at the handles and the beading along the rim of the top, it's really endearing, and so pretty all polished up, it looks happy and proud! PS ~ We found five muddlers over the weekend! And unbelievably, it makes Bill's Mojito's even better! You sure "clean" up well, Bill! They should put you in one of those commercials, because you are the poster guy for cleaning these old finds till they shine. I love thrifting. You got some gorgeous finds!! Think I'll go this afternoon. Haven't been in about a week. Wow, Bill somehow I missed this post from you.....you found some terrific bargains...my fav. are the mint julip cups as well..how perfect that they came with a B....my dad's name was Bill also! thanks for sharing....and good job on the silver polishing!! Wahoo for the bargains.....I'm not sure I've ever seen such good bargains as you find at a Goodwill here! Bill, you sure know how to kick up some deals! Silver set of 4 B cups...fav!! I got a set of 6 napkin rings with cursive Js on them for 2.99 in Onancock, Va on our trip. Our oldest son's initial. Dish xox! too for those soup plates/bowls. Excellent deals! I have to admit, I like to hit the Goodwill and D.A.V. (my husband calls it Dave's! ), and other thrift stores. I don't get in as often as I should, so I'm sure I miss out on a lot. Oh...and I agree with you that Wright's silver creams is THE BEST for cleaning & polishing silver! I keep multiple containers of it in the pantry. I wish they sold it in gallon buckets! :-) Have a great day! Hi, Bill! Sometimes, when I have a little extra time to "surf," I'll click on one of your older posts for a "extra Bill fix." 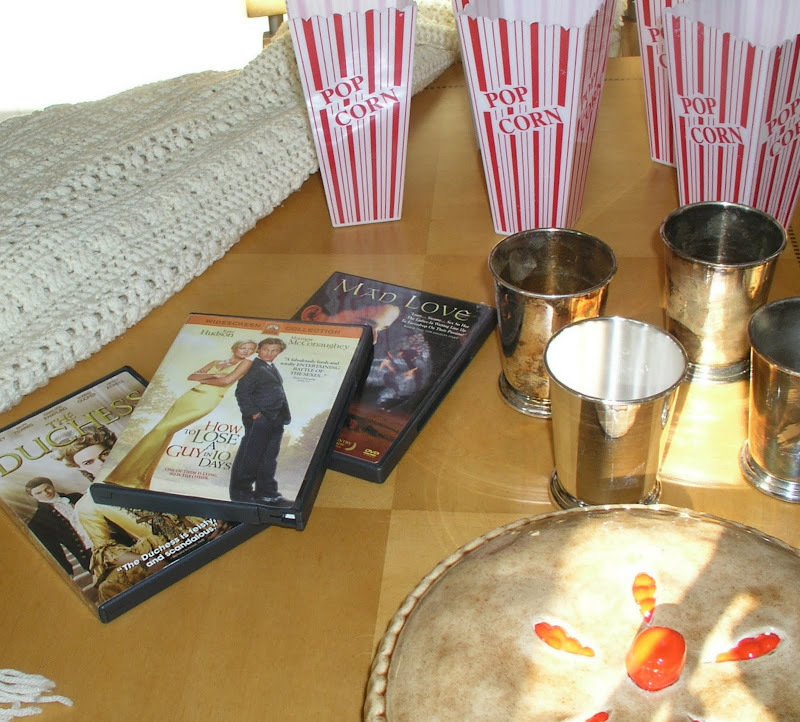 That's not to say that I didn't love your tablescape for this week, of course. I really did enjoy this post, too, though. I'd have to say that your julep cups were definitely your best find. I've been on the lookout for a set for a long time and can only hope to eventually find such a great bargain on them. Your posts are always so informative. As I read about your aluminum casserole, I was wondering what in the world you clean aluminum with and, of course, you went on to tell me! Thanks for all the information and inspiration. I really will do a tablescape one of these days and surprise you!